Can I Use Bleach To Remove Mold? For mold to grow indoors, it needs moisture and food. Moisture is the more important factor that influences mold growth indoors. Controlling indoor moisture helps limit mold growth. Mold does not need a lot of water to grow. A little condensation, in a bathroom or around a window sill, for example, can be enough. “How to remove mold” is a rapidly growing search online but we want to you to know we can do the mold removal process for you. First, chlorine bleach does not have the ability to cut through a dirty surface. Bleach cannot clean dirt and only masks it by bleaching it white or transparent, which is why most believe the bacteria or mold has been killed. Any soiled surface that requires mold restoration will initially require a cleaning before being disinfected with bleach. This is twice the amount of work required to get rid of mold than if the correct product was used in the first place. In addition, the killing power of bleach is stopped by organic material. Second, even full strength chlorine bleach is too diluted to get rid of mold, especially on porous surfaces, such as drywall and wood. The chlorine itself will not soak into porous materials but the water making up 99% of chlorine bleach does, and feeds the mold. The ionic structure of bleach prevents Chlorine from penetrating into porous materials such as drywall and wood—it just stays on the outside surface, whereas mold has enzyme roots growing inside the porous construction materials. Mold grows its roots deep into the surface of drywall and wood and the chlorine can only kill what is on the surface, allowing the roots of the mold to remain very much alive. 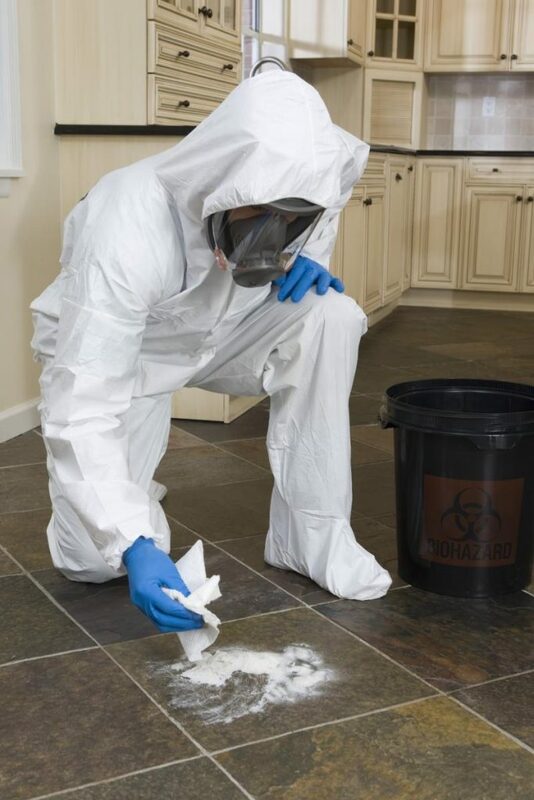 Mold removal of porous materials is the only safe way of getting rid of all the mold. Lastly, whatever killing power chlorine bleach does posses drops rapidly even over a very short period of time. Apart from the fact that the disinfecting power of bleach is quickly deactivated once it comes into contact with organic material, chlorine bleach also has a very short shelf life. As the bleach sits on the grocery store shelf or in the cupboards in a home, the Chlorine ions continually bleed through the plastic which is why bleach smells like bleach even when the bottle is closed. It is reported that in just the first three months after being bottled there is a 50% loss in killing power in an unopened container of bleach. The EPA, various Departments of Health, the Wall Street Journal, and even Clorox, have all stated that bleach is ineffective at killing mold on porous surfaces. The Institute of Inspection, Cleaning and Restoration Certification (IICRC), Clorox, the EPA and OSHA, have all stated that bleach should never be used in mold remediation. Bleach appears to kill mold, but just the surface mold is affected – the hidden mold underneath the surface is alive and well – now it’s been fed and doing better than ever. When the mold eventually grows back, and it will, it will be stronger than before. Bleach seems to help, but it makes the problem worse. There are ways to get rid of your unwanted houseguest, but bleach is not one of them. Call our local professional restoration company, PuroClean Certified Restoration at (417) 233-3111, to get rid of the mold so it doesn’t have the chance to grow any more. Also, we can instruct you on how to remove mold and how we will effectively implement our techniques to ensure mold will be eradicated from your home.